Billy Fox ran his knockout streak to twelve with a first round stoppage of Frankie Mack at The Cambria in Philadelphia on this day in 1944. 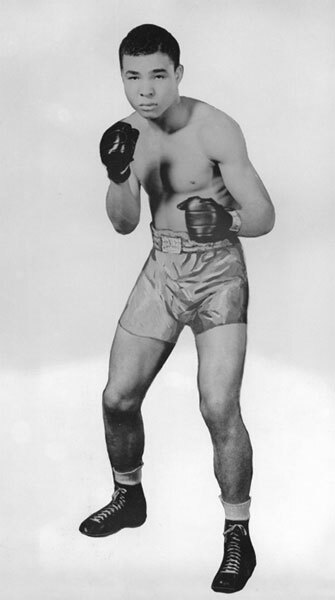 Fox's consecutive KO streak would ultimately reach 43 - a boxing record at the time. The run would be broken in Billy's first try at the Light Heavyweight Championship - a 10th round TKO loss to Gus Lesnevich in 1947. In a return title bout a year later - earned with a dubious KO of Jake LaMotta - Fox would fare much worse, going down against Lesnevich in the 1st round from a sneaky wrecking ball of a right hand. Although it is true that Fox may have had some help along the way (especially in the LaMotta fight), he was a real prospect with great power.